Reginald William Symes was born in Yeovil during the autumn of 1886. 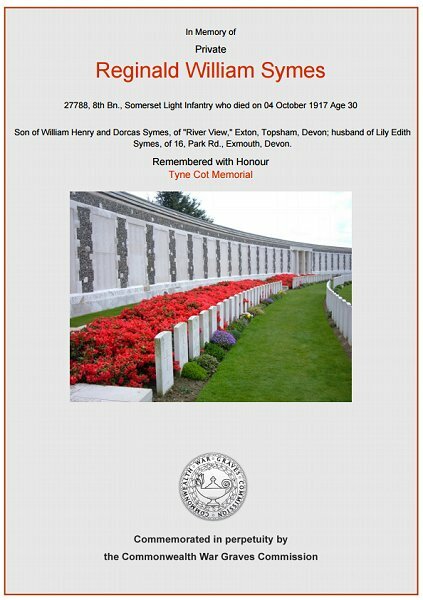 He was the son of market gardener Herbert William Symes (1865-1941) and Dorcas née Pike (1861-1938), originally from Starcross, Devon. Herbert and Dorcas had two sons, both born in Yeovil; Reginald and Lionel Albert (1889-1964). By 1891 the family had moved to Station Road, Woodbury, Devon and were still living there in 1901. I couldn't find Reginald in the 1911 census. In the winter of 1916 Reginald married Lily Edith Dyer at St Thomas (Exeter). They set up home in Exeter just before Reginald enlisted. Although it is not known exactly when Reginald enlisted, he enlisted at Exeter joining 8th (Service) Battalion, Somerset Light Infantry. His Service Number, 27788, suggesting he enlisted during late 1916, probably immediately after his marriage to Lily. He was almost certainly sent to France on 5 April 1917. During 1917 the 8th (Service) Battalion, Somerset Light Infantry were involved in an inordinate amount of fighting including the First Battle of the Scarpe, the capture of Monchy-le-Preux, the Second Battle of the Scarpe, the Battle of Arleux, the Battle of Pilkem Ridge, the Battle of the Menin Road Ridge, the Battle of Polygon Wood and the Battle of Broodseinde. As part of the Arras Offensive the 8th Battalion took an active part in the First Battle of the Scarpe (9 to 14 April 1917), including the capture of Monchy-le-Preux, the Second Battle of the Scarpe (23 to 24 April 1917) and the Battle of Arleux (28 to 29 April 1917). The Arras Offensive was a major British offensive from 9 April to 16 May 1917, troops from the four corners of the British Empire attacked trenches held by the army of Imperial Germany to the east of the French city of Arras. Zero-Hour for the First Battle of the Scarpe had originally been planned for the morning of 8 April (Easter Sunday) but it was postponed 24 hours at the request of the French, despite reasonably good weather in the assault sector. Zero-Day was rescheduled for 9 April with Zero-Hour at 05:30. The assault was preceded by a hurricane bombardment lasting five minutes, following a relatively quiet night. When the time came, it was snowing heavily; Allied troops advancing across no man's land were hindered by large drifts. It was still dark and visibility on the battlefield was very poor. A westerly wind was at the Allied soldiers' backs blowing "a squall of sleet and snow into the faces of the Germans". The combination of the unusual bombardment and poor visibility meant many German troops were caught unawares and taken prisoner, still half-dressed, clambering out of the deep dug-outs of the first two lines of trenches. Others were captured without their boots, trying to escape but stuck in the knée-deep mud of the communication trenches. Most of the British objectives had been achieved by the evening of 10 April though the Germans were still in control of large sections of the trenches between Wancourt and Feuchy. The Battle of Polygon Wood, 25-27 September 1917, was part of the wider Third Battle of Ypres. It came during the second phase of the battle, in which General Herbert Plumer’s Second Army was given the lead. Plumer replaced the ambitious general assaults that had begun the battle with a series of small attacks with limited objectives – his “bite and hold” plan. These attacks involved a long artillery bombardment followed by an attack on a narrow front (2,000 yards wide at Polygon Wood). The attacks were led by lines of skirmishers, followed by small infantry groups. German strong points were to be outflanked rather than assaulted. Each advance would stop after it had moved forward 1,000-1,500 yards. Preparations were then made to fight off any German counterattack. The attack on Polygon Wood was the second of Plumer’s “bite and hold” attacks, after Menin Road. The site of Polygon Wood was captured on 26 September, the target line on 27 September. The attack then stopped, and Plumer prepared for the next attack. The two Australian divisions lost 5,471 men during the Battle of Polygon Wood. The three “bite and hold” attacks brought the front line to the foot of the Passchendaele Ridge, which would be come the target of the First and Second Battles of Passchendaele, and give its name to the entire battle. The Battle of Broodseinde, 4 October 1917, was the last of three successful “bite and hold” battles launched by General Herbert Plumer during the middle phase of the Third Battle of Ypres. Both sides were planning an attack on 4 October. When the British bombardment began, it caught a number of German units out in the open preparing for their own attack. The British attack contained divisions from Britain, New Zealand and Australia. As at Menin Road Ridge and Polygon Wood, the British attack achieved its main objectives and then halted to dig in. Although these attacks are normally described as small scale battles, the casualty figures demonstrate the real scale of the fighting. The Germans suffered 10,000 casualties and lost 5,000 prisoners. On the Allied side the Australians suffered 6,432 casualties, the New Zealanders 892 and the British 300. Reginald was killed in action on 4 October 1917 during the Battle of Broodseinde. He was 30 years old. Reginald is commemorated on the Tyne Cot memorial, Panels 41 to 42 and 163A. His name was added to the War Memorial in the Borough in 2018. The Commonwealth War Graves Commission certificate in memory of Reginald Symes.